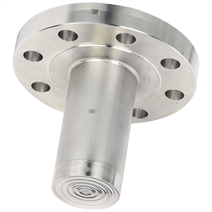 The model 990.29 diaphragm seal is available in place of a blind flange for all commonly used standard flanges. Due to the extended diaphragm (tube version), the diaphragm seal can be used at thick-walled or insulated locations in pipeline and vessel construction. For the material selection WIKA offers a variety of solutions, in which the upper body of the diaphragm seal, the extended diaphragm and the wetted parts can be made of identical or different materials. The diaphragm and the extended diaphragm can, as an alternative, be coated.